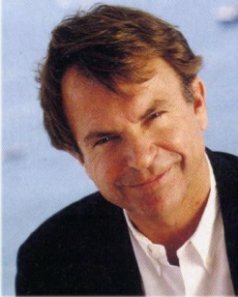 The Sam Neill Home Page will no longer be updated as of 15 January 2005 and is no longer the Official Sam Neill Website. The webmaster has decided to retire after 10 years of work on the site. For the time being, the photos, sounds, FAQ, and filmography (as of their last update) will remain online as a resource. The mailing lists will also continue to exist. Thanks to everyone who helped work on this site over the past 10 years. It's been a blast! Please continue to visit the website for Sam Neill's winery Two Paddocks and for his Production Company, Huntaway Films. This webpage has been retired and will no longer be updated. Additionally it is no longer official and is not sponsored or endorsed by Mr. Neill. Mr. Neill does not have an email address, so we cannot forward any e-mail to him. Fan mail to Mr. Neill should be sent to the address on the Fandom Information page. In addition, we do not own the copyright to much of the material available on this page; the copyright owners do. We have tried to provide attribution wherever possible. If we are asked by the copyright holders to remove any materials due to copyright infringement, we will politely comply with their request. Otherwise, please enjoy the information and materials provided below and thanks for visiting. From the FAQ, Part 1.3: "Mr. Neill guards his privacy fiercely and we respect that, encouraging anyone reading this FAQ to do the same." Thank you.